Last month, I wrote about SalesforceIQ in this blog post. Actually, I basically spent the whole time declaring my love for the app and its impressively long list of features. The goal with today’s post is to clarify some of the bigger picture questions about the application and provide some insight on how to use SalesforceIQ Starter for your business. And RIP to Group Edition. SalesforceIQ Starter is Salesforce’s new basic CRM offering. It replaces the venerable old Group Edition. And I LOVE that fact. Group Edition was a pared down version of Salesforce that had just enough functionality to make you want to buy the Professional Edition, but with all the complexity of setting up an Enterprise Edition instance. In other words, the complexity of setup far outweighed the advantages offered by the tool. BUT NO MORE! SalesforceIQ Starter now fills that gap nicely. It’s simple to set up–import some data, get your users in, and go. I’m a big fan of the speed and simplicity of the way it works, and I can think of a lot of small businesses that don’t have a CRM that can benefit from setting this up. 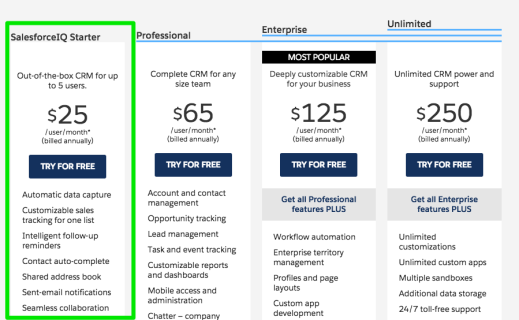 The screenshot below is from Salesforce’s own Pricing and Editions page. Bam, there it is! So what about the other version? The other version is an add-on and enhancement for current Sales Cloud users. It exists in the form of a mobile app (now on Android!) and Chrome Plugin (for Gmail users only so far). The comments below are based on my own research and recent conversations with some knowledgeable industry insiders. Will I have to pay for the Chrome extension? These tools are in beta. They are currently fully functional and will connect to your Gmail account and Salesforce org to allow for all of the features I blogged about in my last post. It is unknown at this time whether they will become a separate, paid offering, or if they will become a value add to the Sales Cloud. What about the Mobile app–will I have to pay for that? Same answer, currently in beta (and free!). It may become a paid or subscription offering in the future, so this is TBD. We’re an Exchange shop and don’t use icky Google. Will it work with that? Not at this time. My information indicates that a desktop Outlook client is a high priority item for the team, but, at the time of writing, it hasn’t yet been released. As a side note, I’m really looking forward to this. It might be a great way to enable a lightweight connector between Outlook and Salesforce and leverage some of the newfound Salesforce/Microsoft love they’ve been touting. Should I even bother installing these apps if I might have to pay for them? Heck, yes! They’re free right now and really stable. I found a few small things that I posted to the Idea Exchange for the product. The dev team is rapidly iterating the product, and I’ve seen a few updates come over already in the past month. SalesforceIQ is a big productivity enhancer. In whatever form you can, get it. It’s either going to introduce you to CRM through the SalesforceIQ Starter package or enhance your current Sales Cloud use through all of the neat features that it brings to the table. It’s easy to install and get going, but if you are looking for help, Red Argyle is happy to work with you on getting this app out to your team.